Only two buildings survived the fire that devastated the medieval Palace of Westminster in 1834. The stone-built Jewel Tower is one. 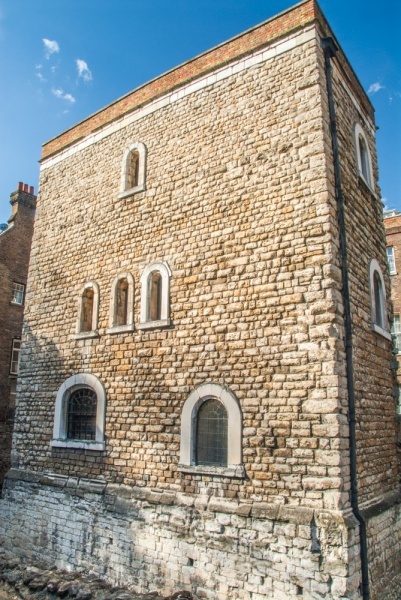 The Tower was built 1365-66 as a safe storage space for Edward III's silver plate (his treasures), and it was originally known as the King's Privy Wardrobe, or simply, Jewel House. The tower was built in a private area of the Palace of Westminster, where the royal family could retreat to their own set of residence chambers, hall, and chapels, away from the more public bustle centred on Westminster Hall. The new tower stood at one end of a garden, with a moat on two sides. The master mason was Henry Yevele, one of the most prolific medieval architects and the man most responsible for the popularity of Perpendicular Gothic. The first floor was used as accommodation for the 'keeper', with the second and third floors used as secure storage areas. The second floor shows evidence of double-doors, suggesting that the most valuable items were stored there. In the Tudor period the Jewel Tower became a general storehouse, then from 1600 it was used to store official documents from the House of Lords. The first floor was used to store Acts of Parliament, journals and minute-books. A special brick and mortar vault was built to house the documents and protect them from fire. It was just as well that these extra precautions were taken, for the Tower and its precious document store survived the fire that destroyed the Palace in 1834. When the new Palace of Westminster was built by Sir Charles Barry the Victoria Tower - across the road from the Jewel Tower - was designed as a fire-proof document store, and all the records were moved from the Jewel Tower in 1864. In 1869 the medieval tower became a test centre for the Board of Trade Standards Department, to establish official weights and measures. The bottom two floors were used to carry out tests, while standard weights and measures were stored on the top floor. Unfortunately, increased traffic along the nearby road, with its accompanying noise and vibration, meant that the Tower was not an ideal place to carry out exacting measurements. In 1938 the Department left the Tower for new headquarters. 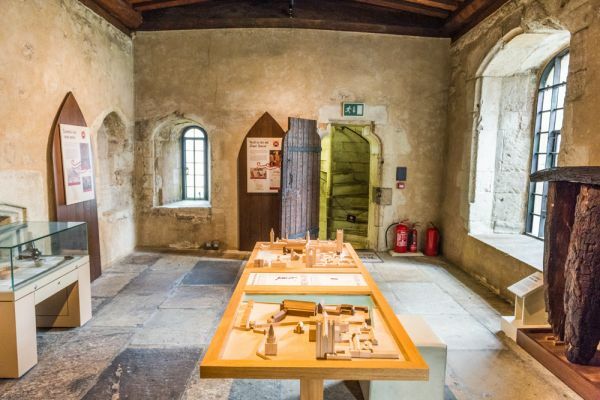 The building was damaged by bombs in WWII, and subsequent restoration involved clearing out several buildings that had encroached against the Tower's walls over the years. Internally, much of the original 14th-century architecture has survived. 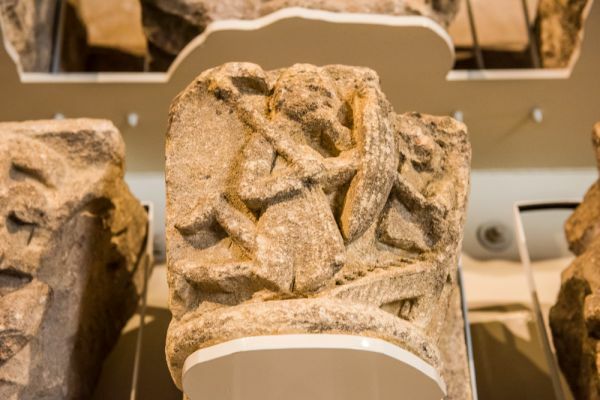 The outstanding feature of the building is an original 14th-century ribbed vault, with beautifully carved ceiling bosses depicting grotesque faces and animal heads, foliage, eagles, and swans. 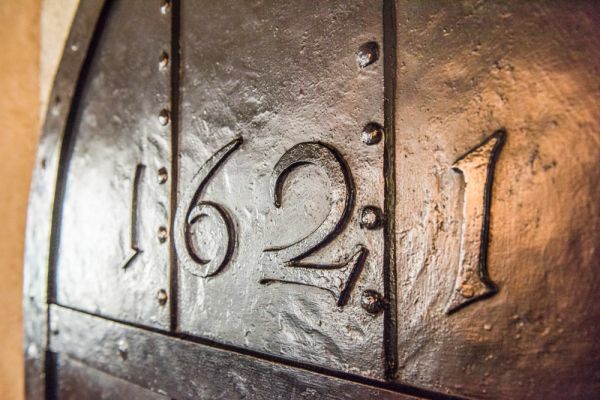 The second floor has a mid-18th-century vault, with a turret-room built in 1621. 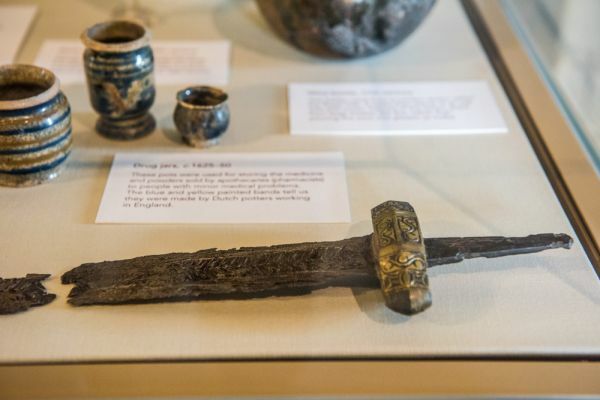 Look for the cipher of James I on the lock-plate of the iron door leading to the turret room. 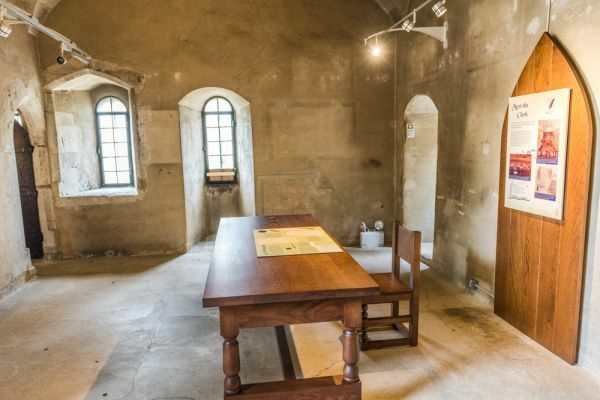 There can be no doubt that the top floor was meant to be the most secure by its medieval builders; it is secured by double doors, and the original 14th-century inner door has survived. 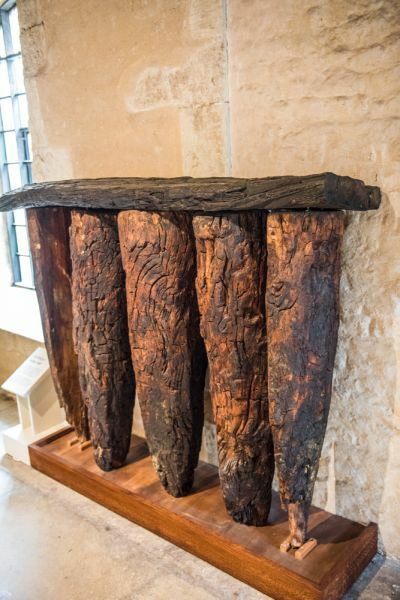 Much of the roof had to be replaced after the WWII bombing, but some of the medieval timbers have been preserved. 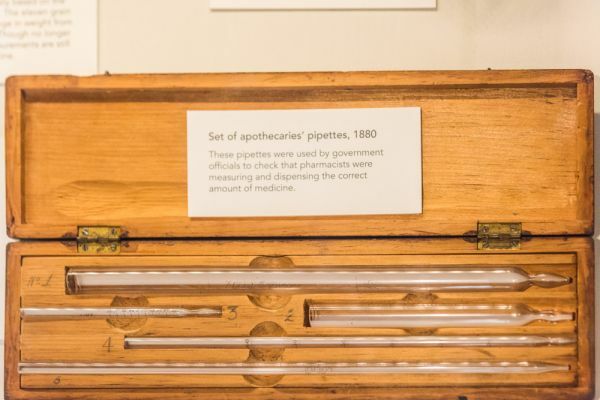 One of the most interesting features on the Tower is a display on the history of official weights and measures; how they were established over time, and how different monarchs tried to standardise the basis of measurement. 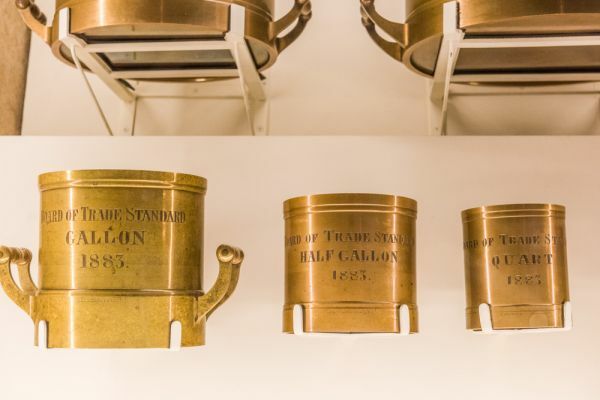 It is fascinating to see the actual measures for quarts, pints, and gallons; measures that I grew up with the days before the metric system became the norm. The Jewel Tower is located at the opposite end of the Houses of Parliament to the clock tower that houses Big Ben.